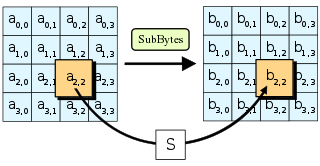 The design and strength of all key lengths of the AES algorithm（i.e., 128, 192 and 256）are sufficient to protect classified information up to the SECRET level. TOP SECRET information will require use of either the 192 or 256 key lengths. The implementation of AES in products intended to protect national security systems and/or information must be reviewed and certified by NSA prior to their acquisition and use. ^ Daniel J. Bernstei. Cache-timing attacks on AES (PDF). Citeseer. 2005年4月. ^ Lou Scheffer. Successful remote AES key extraction. 2005-04-17 [2011-05-16]. ^ Bruce Schneier. AES Timing Attack. 2005-05-17 [2011-05-16]. ^ Eran Tromer , Dag Arne Osvik and Adi Shamir. Efficient Cache Attacks on AES, and Countermeasures (PDF). Journal of cryptology. 2010, 23 (1): 37–71. Joan Daemen, Steve Borg and Vincent Rijmen, "The Design of Rijndael: AES - The Advanced Encryption Standard." Springer-Verlag, 2002. ISBN 3-540-42580-2.